Windows 8, an answer from Microsoft to the rapid-growing Apple Inc. in personal computer (MacBook Air) and tablet market (iPad), finally has it’s Developer Preview released to the public. Since it is not even a beta release, it is definitely not recommended for a normal user to install it over the stable Windows Operating System. However, it is certainly interesting to test run the new Windows 8 Developer Preview, so to do this without causing any damage on your stable system is – Virtual Machine. Currently the Windows 8 Developer Preview can be easily install on Oracle VM VirtualBox only, not on the VMWare Player (do let me know if it is possible). Step-by-step guide to install Windows 8 in VirtualBox after the jump. 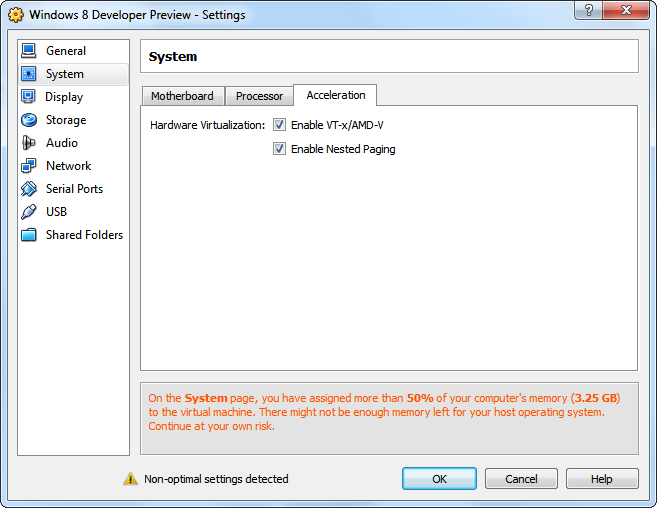 Besides that, also make sure that your computer have the Virtualization Technology (VT-x/AMD-V) activated in the BIOS. Proceed to the installation if you are ready with everything. This part might be tricky. By default, the VDI file generated will be mounted as a SATA HDD. However, if it is treated as a SATA HDD, Windows 8 will not be able to initiate the installation and BSOD (A very cute one) occurs. So the workaround is to mount the VDI file under the IDE controller, this way Windows 8 Developer Preview install perfectly. 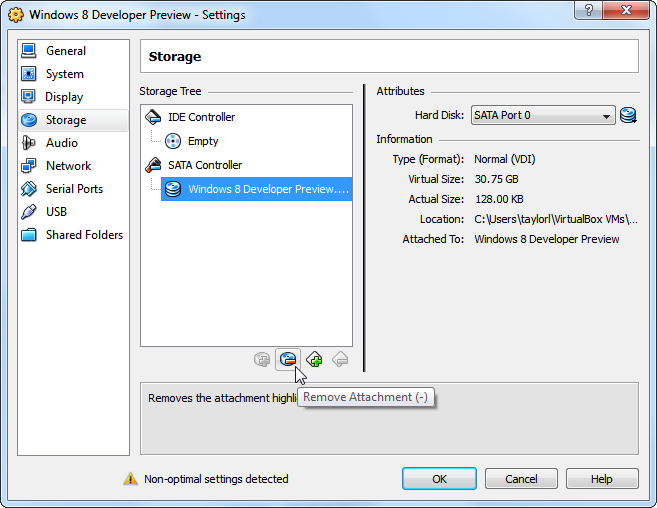 Also under Storage, mount the ISO file containing Windows 8 Developer Preview. 4. Once everything is set, start installing Windows 8! The installation process is pretty much similar to the one in Windows 7, so nothing much there. When Windows 8 started up, you will need to enter your Windows Live ID and password. 5. 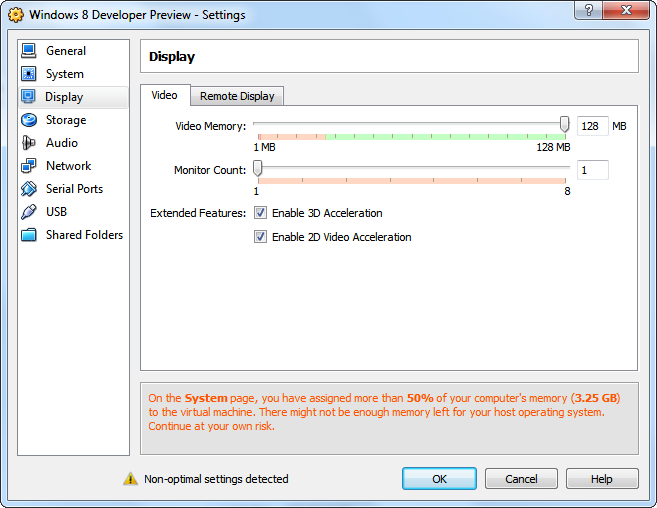 Once you have successfully installed Windows 8, enable the native resolution of your monitor in Windows 8! Good luck! If you can’t wait, I have includes a few screenshots of Windows 8 running in VirtualBox. Thanks for the guide! I don’t suppose you’ve figured out a way to install VirtualBox guest additions? I keep getting told that it doesn’t support this version of Windows. You are right. At the moment, I doesn’t seems to able to make it install properly into Windows 8, probably the compatibility isn’t there yet. That’s a shame. I would really like to set the resolution to 1920×1080, but it doesn’t seem to support it. 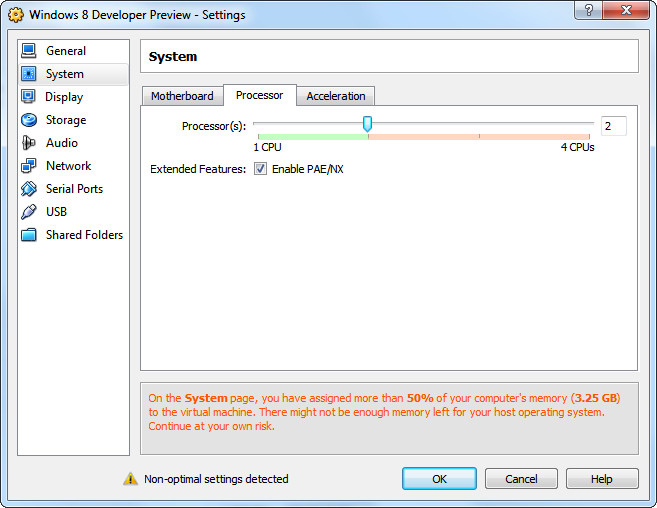 Also the chipset selected has to be PIIX3 otherwise the installation will not even load. I got mine to run at 1920x1080x32. Thanks for the tips! I will try it and see if it works for me. Where do you find the data? I don’t exactly know where to find it and how to change it. Could you please explain in detail? 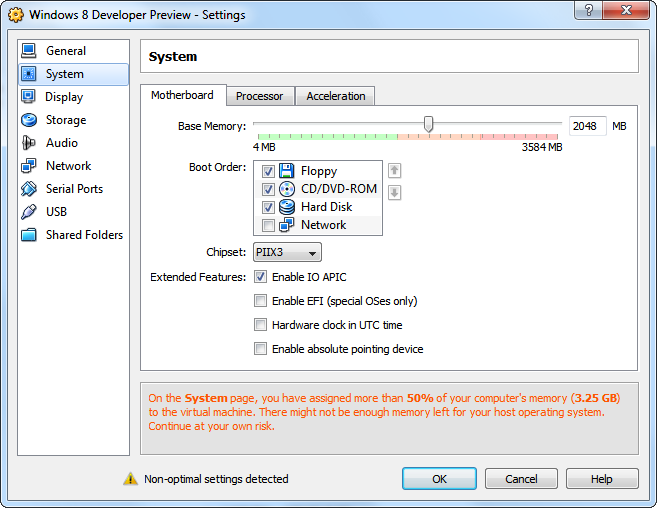 It’s a general parameter for VirtualBox, so it should work no matter which platform you are using. I wondered around exactly what it was doing, but there’s not much explanation there. It should be in the tech manuals for VirtualBox somewhere. Thanks for the tips! This time I have make it work beautifully! Previously is about copy-paste issue. Glad to know you made it running at the desired resolution, though for me I still failed to force it running at my monitor native resolution. Did you manage to get it installed? I ran into the same issue as Mel… it keeps saying “Your computer needs to resart” during the installation process. This is right after the “Load files” bar completes and “Windows Developer Preview” pops up. I’m having the same problem in VirtualBox. “Your computer needs to restart” every time. is anyone able to activate Wi-fi on the VirtualBox? Please help! It happens right after “Windows Developer Preview” is displayed on the screen. “Your computer needs to restart. Please press and hold the power button” then a bunch of 0x0(…)0A codes. 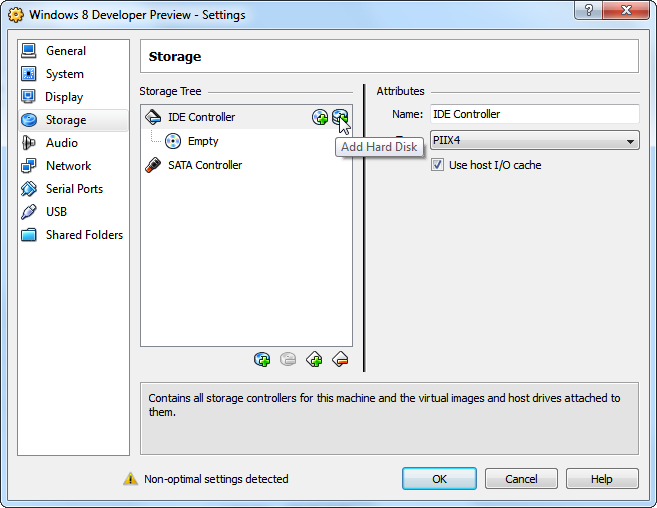 Try checking this out…mentions how you need hardware virtualization enabled. Hey guys, please someone he me. Windows 8 Developer Preview is not meant for daily-use yet as it is still in it’s very early stage of development, so it’s not surprising if there are some compatibility issue with it. I would suggest you go back to Windows 7 and play around WIndows 8 Dev Preview in another partition a.k.a dual boot configuration. I have found sites googling window8 vmware that states you can use vmware workstation with windows 8.